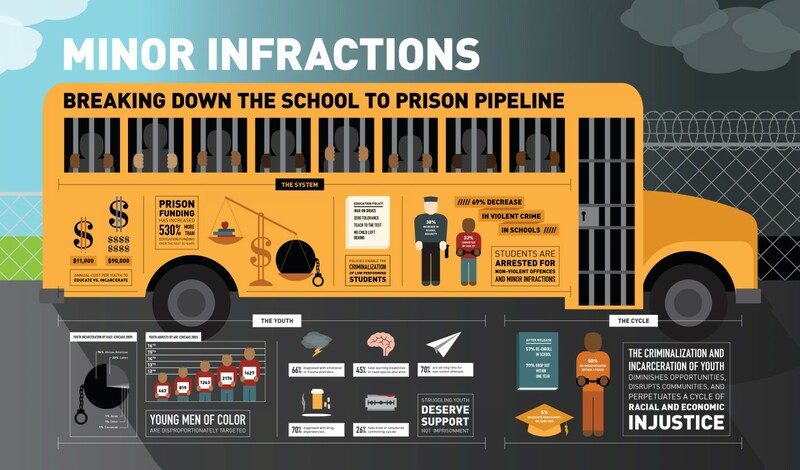 The “School-to-Prison Pipeline” (STPP) describes the process by which students are pushed out of their schools and into the criminal justice system. While the problem is generally tied to drop-out rates in schools, it is specifically associated with the imposition of harsh disciplinary systems. Schools have increasingly adopted “zero-tolerance” policies, which punish small infractions with suspension and expulsion. Coupled with these policies is an increased police presence in schools, resulting in arrests and prosecutions for student behavior that might otherwise have been handled by teachers and staff. Even when students’ interactions with police officers don’t result in immediate exposure to the criminal justice system, being treated as a criminal, with suspicion from figures of authority, takes a psychological toll. Students can only go so long being treated by school administrators and police officers as if they are bad, stupid, inherently up to no good, before they internalize these ideas. These practices, collectively, contribute to our national problem of mass incarceration; reform of disciplinary policy is urgently needed. DC was one of 11 states that reported gaps in the suspension rates of black and white students that were larger than the rest of the nation in 2014 (Peerman, 2014). Where nationally, black students were three times as likely as white students to be suspended or expelled in the 2013-14 school year, they were six times as likely in the DC school system (Peerman, 2014). While the DC School Board has made it a priority to reduce the number of suspensions and expulsions, the Washington Post reported last year that some schools regularly circulated lists of students who were not permitted to enter the building because of their misbehavior, and only a fraction of such students had been recorded as suspended (Matos, 2017). Thus, the problem of school pushout and the STPP is pervasive within DC schools, and concerted grassroots action is necessary if the pipeline is to be dismantled.